AMES, Iowa — The Iowa Monarch Conservation Consortium has set a goal of acres devoted to monarch butterfly habitat in the state by 2038. “The consortium has worked collaboratively with diverse stakeholders to develop a comprehensive plan to expand habitat on our agricultural land, urban areas, roadsides, and other public land. We appreciate the many partners that have been involved and are encouraged by the work already underway,” said Mike Naig, Iowa Secretary of Agriculture. The updated Iowa Monarch Conservation Strategy seeks to establish approximately 480,000 to 830,000 acres of monarch habitat by 2038. The strategy — developed by the consortium members — guides the implementation and documentation of a voluntary, statewide conservation effort based on the best available science. The consortium is a group of 40 organizations, including agricultural and conservation associations, agribusiness and utility companies, universities and county, state and federal agencies. Iowa’s habitat goals are included in the Mid-America Monarch Conservation Strategy draft, released by the Midwest Association of Fish and Wildlife Agencies. 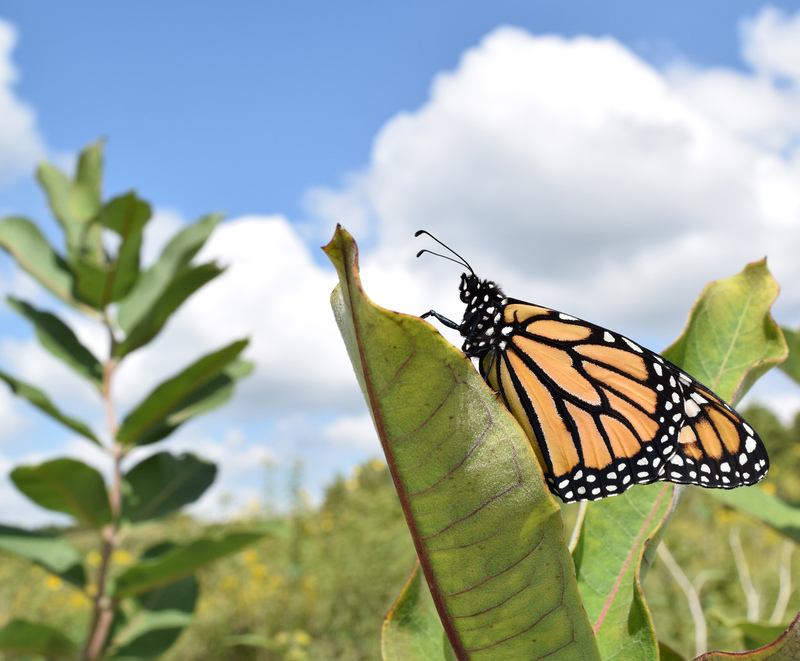 The Mid-America strategy draft describes how the North Central states in the monarch’s northern breeding grounds will collectively establish 1.3 billion new milkweed stems over the next 20 years. Iowa’s strategy estimates 127 to 188 million new stems will be established within Iowa. Female monarchs lay eggs exclusively on milkweed plants so national efforts focus on establishment of new milkweed stems for conservation goals. However, habitat plantings are expected to include a diverse array of nectar species to provide forage for adult monarchs throughout their life cycle and seasonal migrations. The monarch population has declined by more than 80 percent during the last 20 years in North America. Surveys of the 2017-2018 overwintering generation of monarchs indicate the numbers are still less than half of the size needed to ensure a sustainable population. The U.S. Fish and Wildlife Service has until June of 2019 to determine whether the monarch should be listed under the Endangered Species Act. The consortium seeks to demonstrate how voluntary efforts can support species recovery and avoid the need to list the monarch. Information on how to support monarch conservation is available at www.iowamonarchs.info. The Iowa Monarch Conservation Consortium formed in 2015 in response to monarch population declines. More information about consortium is available at www.iowamonarchs.info. Iowa Department of Agriculture and Land Stewardship; Iowa Department of Natural Resources; Iowa State University; Alliant Energy; BASF, Bayer CropScience; Blank Park Zoo; Bur Oak Land Trust; Central College; DuPont Pioneer; Environmental Defense Fund; Iowa Association of Electric Cooperatives; Iowa Association of Electric Cooperatives; Iowa Cattlemen’s Association; Iowa Corn Growers Association; Iowa County Conservation System; Iowa Farm Bureau Federation; Iowa Natural Heritage Foundation; Iowa National Guard; Iowa Nature Conservancy; Iowa Pork Producers Association; Iowa Soybean Association; Iowa Renewable Fuels Association; Iowa Turkey Federation; Iowa Wildlife Federation; ITC Midwest; Luther College; Monarch Watch; Monsanto; Muscatine Island Research Farm Association, Fruitland; Northeast Iowa Agricultural Experimental Association, Nashua; North Central Iowa Research Association, Kanawha; Northwest Iowa Experimental Association, Sutherland; Pheasants Forever; Practical Farmers of Iowa; Sand County Foundation; Soil and Water Conservation Society; Southeast Iowa Agricultural Research Association, Crawfordsville; Syngenta; Trees Forever; Western Iowa Experimental Farm Association, Castana; University of Minnesota Monarch Butterfly Laboratory; University of Northern Iowa Tallgrass Prairie Center; U.S. Department of Agriculture Agricultural Research Service Corn Insects and Crop Genetics Research Unit; Wallace Foundation for Rural Research and Development, Lewis; Whiterock Conservancy; and Women Food & Ag Network. Iowa-based U.S. Department of Agriculture Farm Service Agency, U.S. Department of Agriculture Natural Resources Conservation Service and US Fish and Wildlife Service are ex officio partners.